While in Philadelphia we stayed in the Logan Hotel. This put us two doors down from The Franklin Institute, which was high on my list of places to visit. 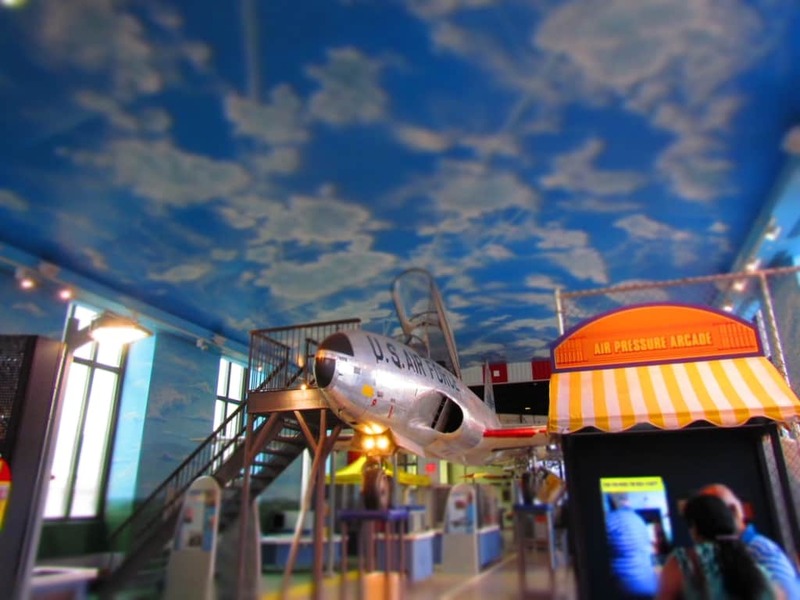 This cutting edge science museum was actually founded in 1824, and named for the American scientist, Benjamin Franklin. 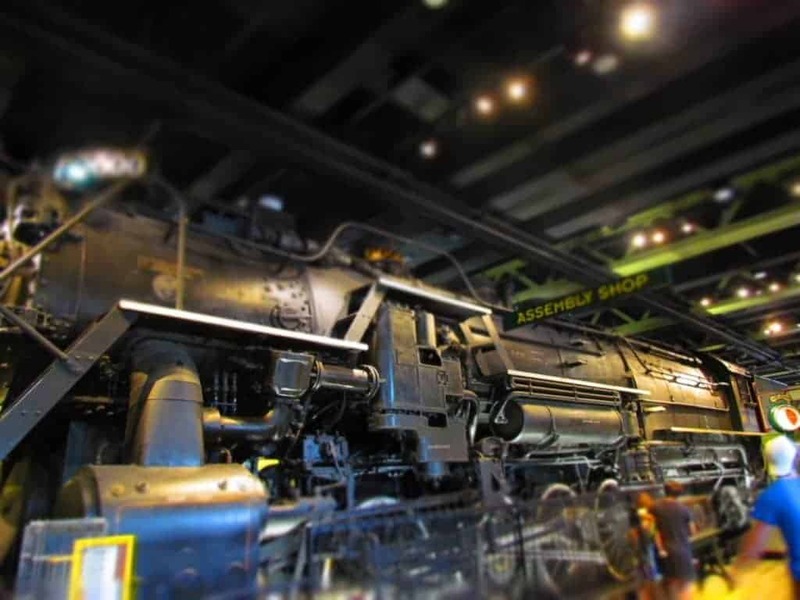 The museum began life focused on industrial sciences, with many featuring steam power at that time. Much of the early years were spent involved with research projects. In those days they even published a scientific paper titled Journal of The Franklin Institute. Their original home, on 7th Street, eventually grew too small for their exhibits. The current home, near 20th & Ben Franklin Pkwy, was opened in 1934. Upon entering the building, the first thing we saw was the 20 foot tall statue of Benjamin Franklin. The statue weighs 30 tons, and sits on a 92 ton pedestal. It is certainly an impressive first sight. We passed through the rotunda, and into the museum. After paying our $20.00 each, we were ready to explore. Looking at the map, we knew we would never be able to tackle the entire museum in one visit. We decided to just plunge in, and see what we could. Starting at the Electricity exhibit seemed like a good place, in honor of Ben Franklin. The museum is broken into segments dedicated to various scientific regions. We found a lot of them are housed in large rooms, which hold all of the displays associated with the particular field. Being dedicated to Benjamin Franklin, it was apparent that there would be some references. 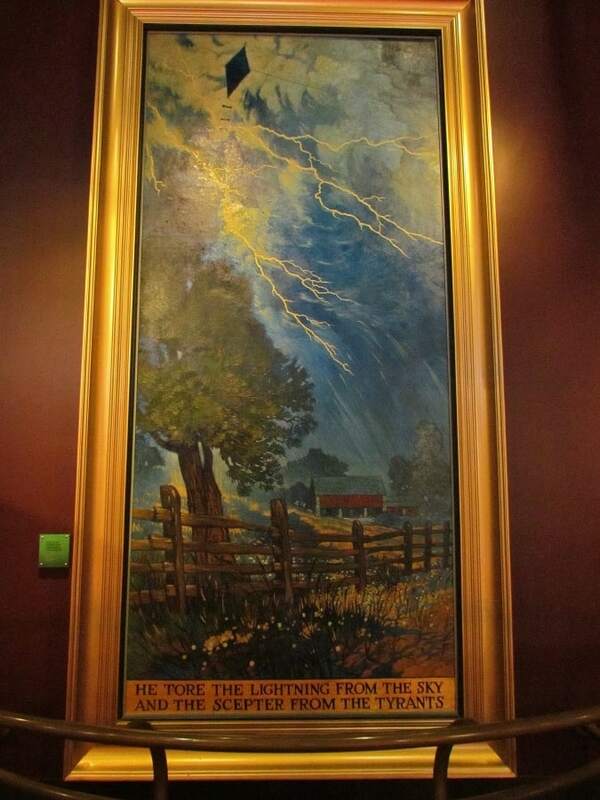 A large painting reminded us of his theoretical experiments on electricity. Whether true or not, many people will always associate the kite flying in a lightning storm with this historical character. Nearby we saw a model of the lightning rod invented by Franklin. 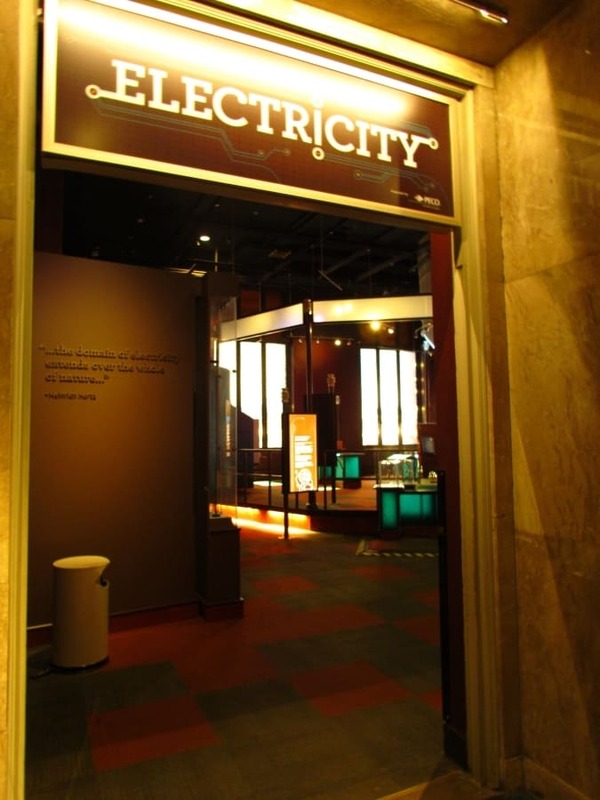 The exhibits in this room are designed to showcase various ways we create and use electricity in everyday life. Various displays allow visitors to manually create power. We found a device that required us to use our body to complete a circuit, which shows the low resistance level of the human body. There is even an interactive machine that sends static into the body. It makes your hair stand on end, but it didn’t really work on me too well. (Yes, I know that I am bald.) 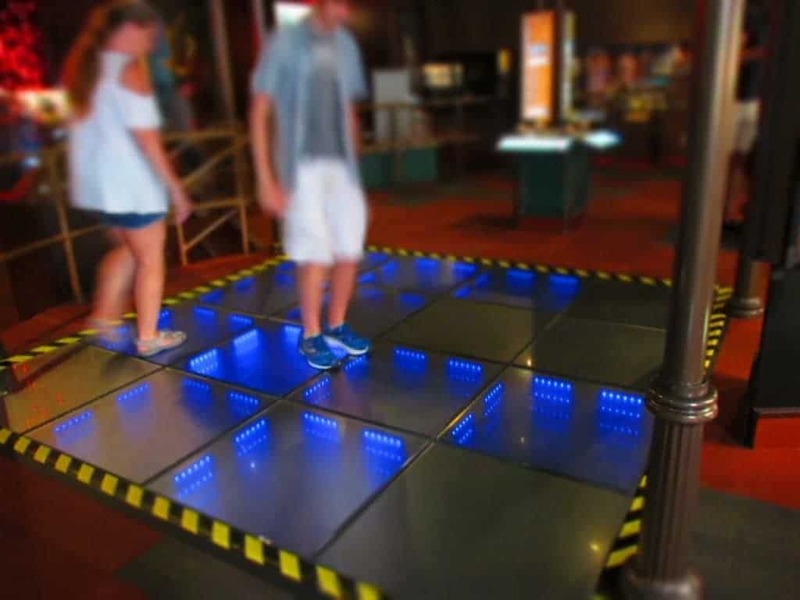 A Plexiglas floor had panels that lit up from the pressure of stepping on them. It was thoroughly entertaining watching people trying to get every square lit at the same time. By the way, no one accomplished this during our time in the room. While we were in the Electricity room at The Franklin Institute, we heard an announcement on the public announcement system. It warned the the Tesla Coil would be firing soon. We were preparing to move to the next area, but now we just had to stay for a while. When the coil fired, the room got very quiet. As the high voltage arcs flickered around the display, everyone watched with amazement. Afterwards, there was a collective sigh of relief, and soon the room refilled with the sounds and squeals of people playing with the exhibits. The next room was all about the planet we live on. Here we found displays focused on how events above and below the surface affect our environment. We saw a lot of information about how tectonic plate movement, volcanoes, storms, and flooding alter our lives. Kids crawled through a play area designed to replicate the look of magma. Another interactive exhibit let us try to design a structure that would withstand earthquake forces. I failed miserably, so it’s a good thing I didn’t go into the architecture field. A Stream Table is set up to allow guests to see the cause and effect of water erosion. This seemed very popular with kids, so I didn’t get a chance to test it myself. Nearby a green screen was being used to test your ability to do a weather report. This exhibit produced a lot of laughs and giggles. 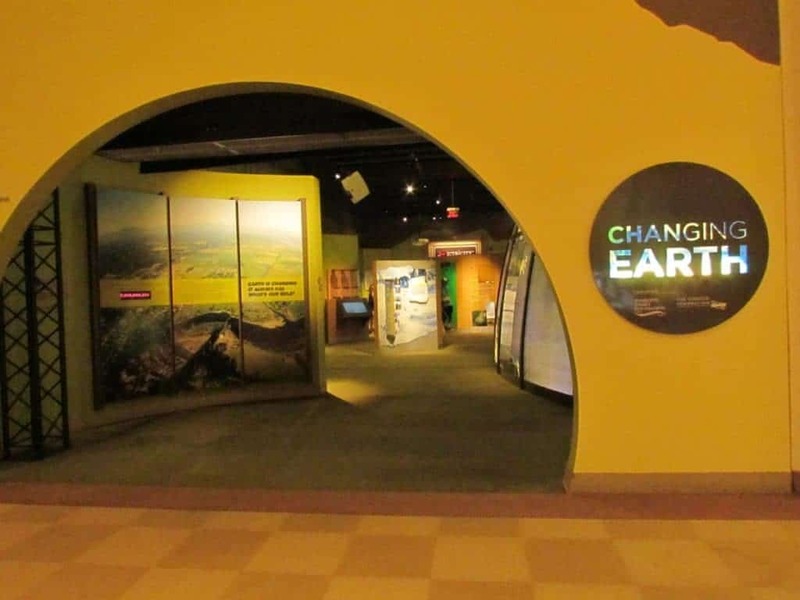 The changes to Earth wouldn’t be complete without highlighting the affect of our carbon footprint. 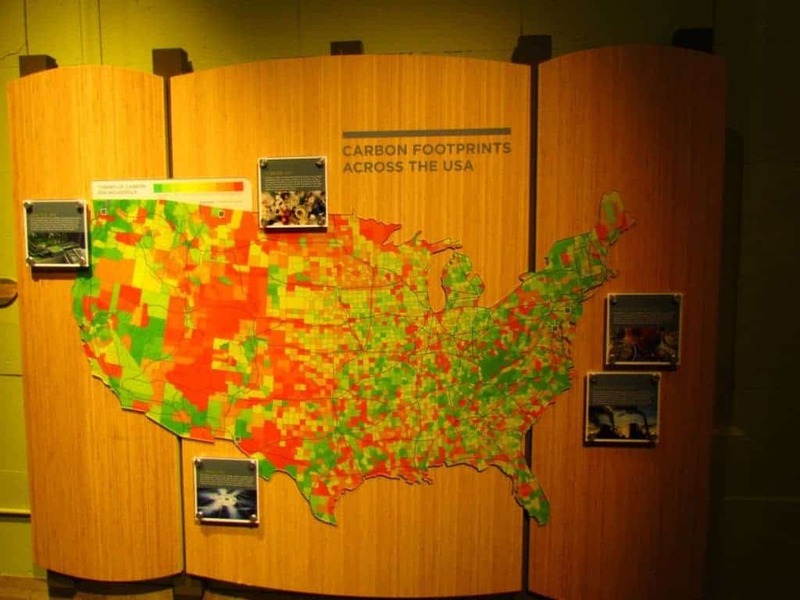 There is even a device set up that allows visitors to determine their own carbon impact. This is really enlightening. We stepped into the Train Factory for a quick peek. Here we saw lots of kids taking an opportunity to get up close to a steam locomotive. How often do you get a chance to climb aboard and imagine yourself as the engineer? Most of the interactive exhibits were being fully utilized, so a quick glance over some shoulders was all we got. In this area you can learn how steam power works, as well as how the shape of the wheels affect the train’s movement. There is even an exhibit that allows you to design your own train. We figured if the kids were busy with the trains, maybe we would have more room with the planes. 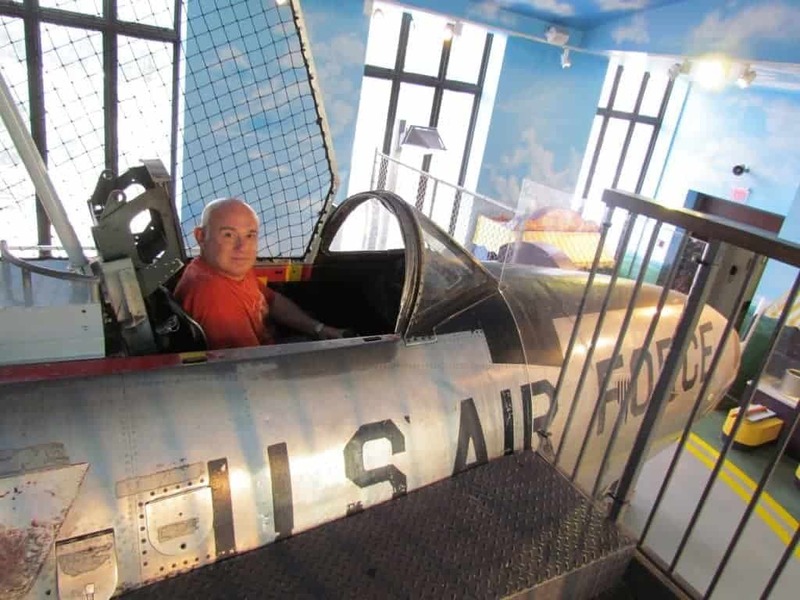 In the Franklin Air Show room I got the chance to climb into a 1948 T-33 Jet Trainer. Yeah, it didn’t take off, but I could still imagine myself soaring through the clouds. Okay, so maybe I am the biggest kid in the place. Next up I tried my hand at the plot training device that simulates lift and direction. I won’t say that I failed, but let’s all be glad that jet didn’t take off. We realized that our available time was quickly disappearing, so we made our way towards the area dedicated to various parts of the human body. The first room was the Giant Heart. 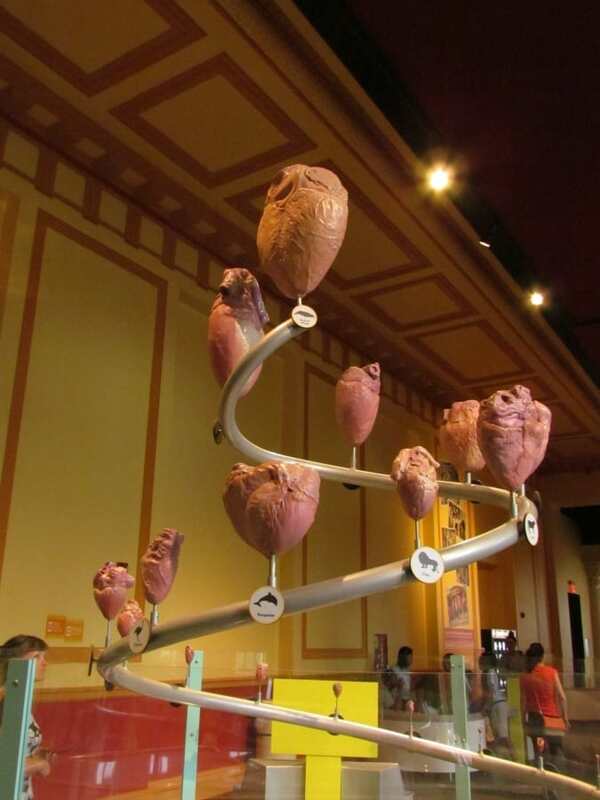 I’m guessing they call it that, because an over-sized display of the human heart is available for kids of all ages to play in and on. We weren’t really into the climb and slide mood, so we spent our time checking out the various interactive exhibits. The first display we came to had replicas of hearts from various animals. Not only did they have replicas, but the device gave us a chance to hear the speed of the heartbeats from various creatures. We found this very interesting, and actually spent quite a bit of time discussing the variations. Finally, I decided I just needed to video Crystal playing with the device. We hope you can hear the heartbeats over the squeals of the kids playing on the Giant Heart. With time running low, we knew we only had time for one more exhibit area. 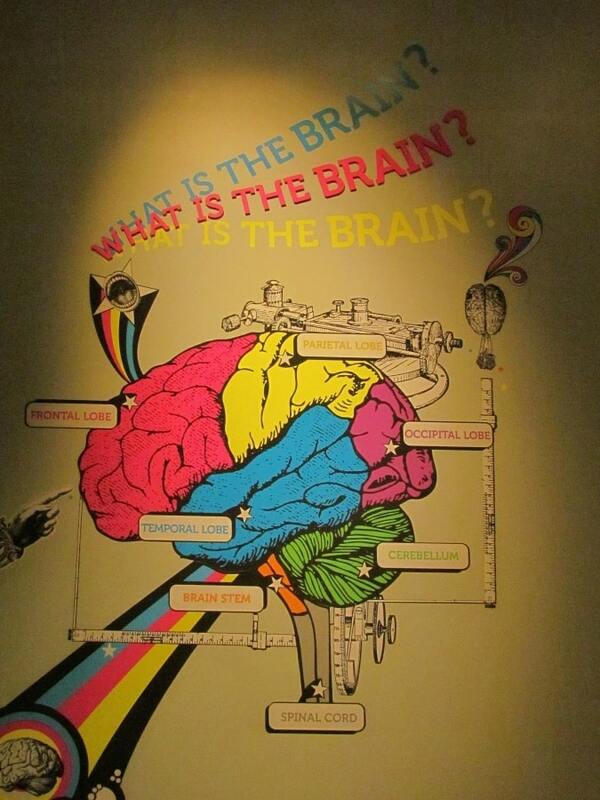 Our choice was to visit The Franklin Institute’s newest exhibit on The Brain. We all have one, and use it more than we realize. Often times we hear how we only utilize a portion of our brain, but in reality we use every part. It is just that different areas have specific jobs. They all work together to make up the greatest super computer ever created. Once again, we found the exhibit to be filled with interactive displays. Our journey through the brain began by learning how neurons work, and how signals pass through the body. 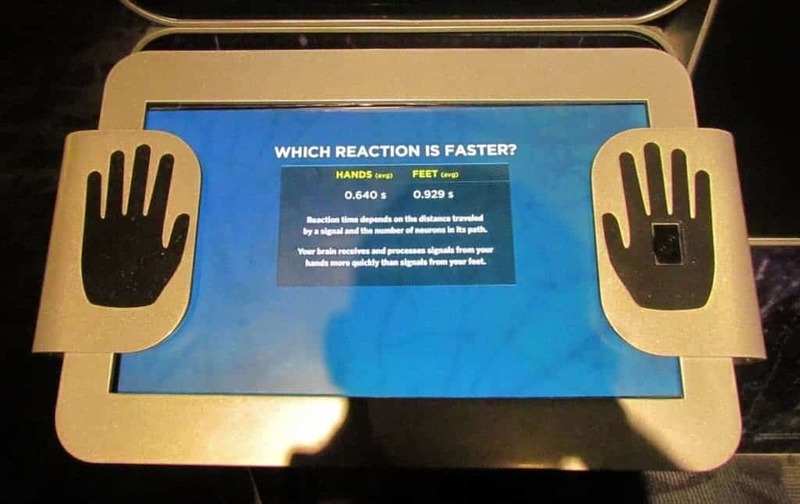 A display was set up to test our reaction time for a pulse sent to the hands versus the feet. This allowed you to see how quickly the message travels, and that it takes longer the farther the route. Another display showed a graph of your heart rate during the moment of a fright. I became intrigued at a jumbo screen that showed my nervous system. As I moved around it mimicked the way the system in my body would flex. I have to say that it was very intriguing. This new area was one that actually had multiple rooms, so as we passed from area to area we saw interesting displays. One entrance had a piano hanging from what looked like a thin rope, and it was dangling above the corridor. This challenged visitors to ignore the warning signs their brains were sending, and pass safely underneath. A display on the fusiform face area of the brain, explained how our mind is always searching for facial recognition. 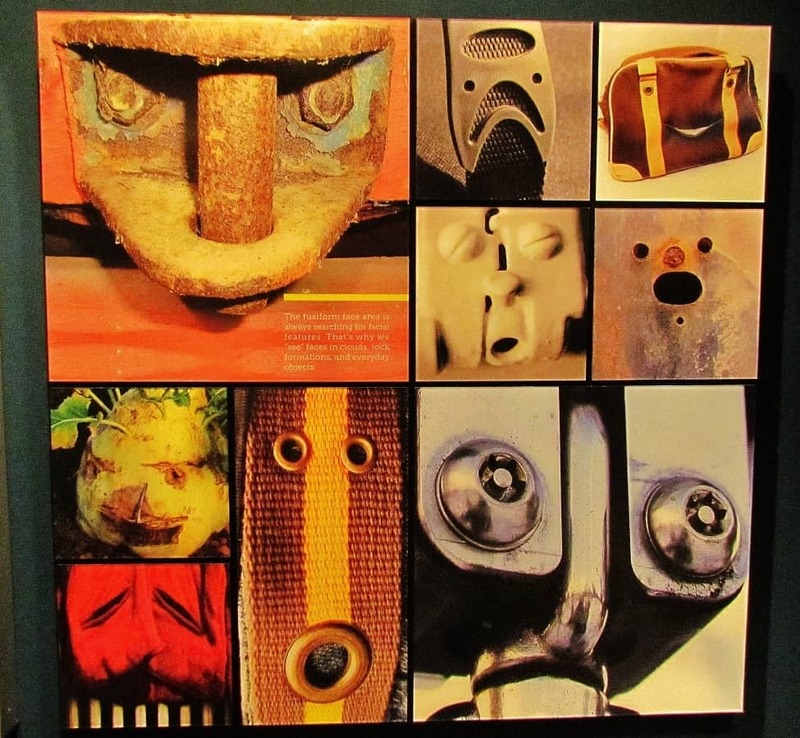 This explains why we often see face forms in everyday objects. One of the final exhibits we had the chance to test allowed two guests to attempt to detect whether one another was lying. It used cameras and TV screens to help each other look for signals. It was very enlightening. Too soon, the museum staff announced that it was time to close, we made our way to the exit. 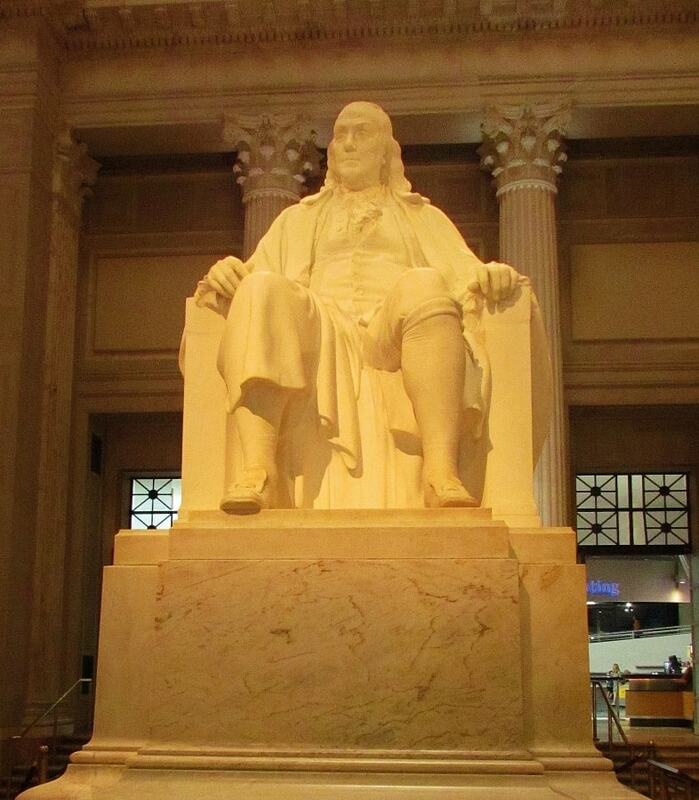 As we passed by Ben, we both knew that a longer visit would be required on our next trip to Philadelphia. It was a great visit. Thanks for taking the time to visit our page. We hope you will return often.